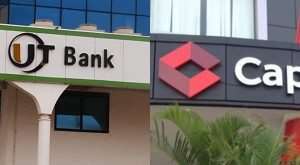 Ex-workers of defunct UT and Capital Banks who allegedly had their contracts terminated by GCB Bank for not possessing the minimum qualification required to work with the bank are hopeful a scheduled meeting between them, the management of GCB Bank, and the Labour Department will yield some positive results. The ex-workers who maintain that the termination of their contracts was unlawful, petitioned the Labour Department some weeks ago to have the department review and settle their dispute. The Daily Graphic reports that the Chief Labour Officer, Eugene Korletey confirmed the invitation of the affected staff and management of GCB Bank over the matter. Speaking to Citi Business News ahead of the scheduled meeting next on Tuesday [April, 162019], Spokesperson for ex-UT and Capital Banks workers, Raymond Addai Danquah said the over 150 sacked workers are seeking fair treatment from GCB Bank. “So we wrote to the Labour Commission about three weeks ago. They wrote to GCB and I think they gave us a date that we are supposed to meet. So God willing we'll be meeting Tuesday at the office of the Chief Labour Officer”, he said adding that “this is a wrongful termination”. Mr. Addai Danquah disclosed that the 2017 badge of workers who were asked to go home are also scheduled to rewrite the two subjects. The sacking comes about two years after the Ghana Commercial Bank took over UT and Capital banks. A copy of their termination letter sighted by Citi Business News and signed by GCB's Head of Human Resources, Kojo Essel Jnr, said “You will be paid an equivalent of one (1) month's basic salary in lieu of notice in line with section 29(a) of our collective agreement and other benefits you may be entitled to per your contract of employment, less any indebtedness to the bank”. An ex-worker who received one of the letters, but asked not to be named, further called for the affected workers to be reinstated. “We need them to reinstate us because it's no fault of ours. If someone has C or D or E or F…and we've all been able to move on to do our undergraduate, some people even have Masters qualification and yet still their appointments have been terminated, based on the reason that they didn't pass their Maths and English in the WASSCE or SSSCE. It is going to affect my livelihood, definitely. There will be no funds coming in and my mum depends on me, my parents depend on me,” he lamented.